* Look for this mark. without using a special app! Turn ON the Wi-Fi setting of your device and select SSID: LAWSON_Free_Wi-Fi. After establishing a Wi-Fi connection, open your browser. Follow the instructions displayed on the screen and proceed through the screens to connect to the Internet. 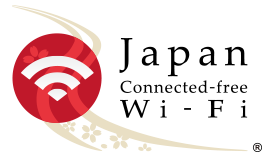 You can connect by using the free “Japan Connected-free Wi-Fi” app for foreign visitors to Japan. You can search for available LAWSON Free　Wi-Fi from below. The Wi-Fi services of the following companies are also available at LAWSON. Some Wi-Fi services are not available depending on the store. and check for the Wi-Fi services from other companies from the available area search page of the respective service. Cannot connect to LAWSON Free Wi-Fi. - If the "LAWSON_Free_Wi-Fi" SSID is not displayed, the service is not available. - If your device's "Wi-Fi Setting" is OFF, turn it ON and select the "LAWSON_Free_Wi-Fi" SSID. - You may be in a store that is not equipped to offer the service. Check from the Store Search page of the LAWSON homepage. - If you have already used "LAWSON Free Wi-Fi" 5 times in the same day, you will not be able to connect. - You cannot connect on Wednesdays from 1:00 to 5:00 AM due to maintenance. Do I need the LAWSON app? The LAWSON app is not needed to connect. Check the above for how to connect. Can I only connect inside a store? Signals are directed to transmit inside the store so that connection is available inside the store. However, connection may be available in parking lots or other areas outside the store due to signal reflection. What devices can I use to connect to LAWSON Free Wi-Fi? You can use devices that can connect to a wireless LAN and equipped with a browser, such as notebook computers and smartphones. You only need to enter your email address. Are there any restrictions on connection time and the number of connections? You can use the service for 60 minutes up to 5 times per day. Are there any restrictions on the sites that I can connect to? For the protection of minors, the connection to sites that are particularly offensive may be restricted. Is there are fee to connect using LAWSON Free Wi-Fi? 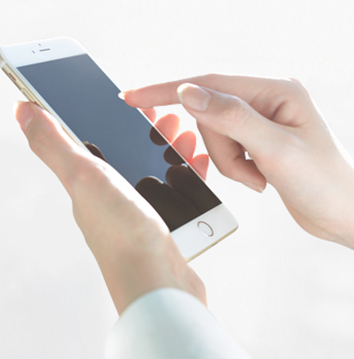 Transmission fees are not incurred when connecting using LAWSON Free Wi-Fi. However, you are responsible for any transmission fees incurred if not connecting using LAWSON Free Wi-Fi. How can I use a public wireless LAN service other than LAWSON Free Wi-Fi? Please contact the public wireless LAN service provider directly. * This service is provided by NTT DOCOMO, INC.